Justin Wheeler knows what makes a fish tank sink or swim. Cleaning fish tanks is a line of work Justin Wheeler just kind of fell into. 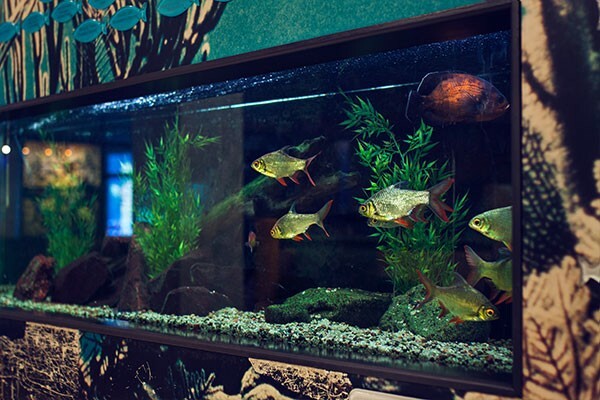 See that fish tank in your dentist's waiting room? Chances are Justin Wheeler has had his hands in it. 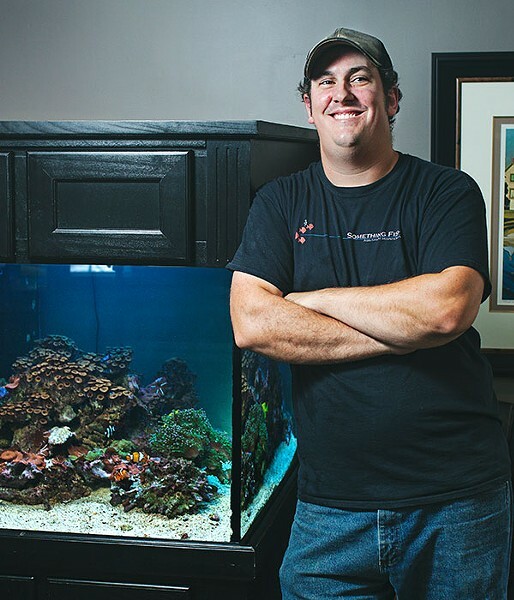 The owner of aquarium maintenance company Something Fishy tends to dozens of fish tanks all over the city. Although Wheeler was literally up to his elbows when first contacted by The Coast, we eventually got ahold of him during a quiet moment to talk about his chosen livelihood and the underappreciated affection of pet fish. The Coast: Do your clients come to you with ideas, or do you advise them? Justin Wheeler: Usually when a new client comes to me, they have these huge ideas they want to do that are quite often out of reach and very impractical. We then look at the realities of having a fish tank, and what we can get away with successfully. For someone who hasn't ever had a fish tank, what's the upkeep? I think a lot of people are surprised, actually. People have no idea that you actually have to do a maintenance routine on these things. I think a lot of people who've never kept fish before think you set it up, you fill it up, you put fish in it and you walk away. Anybody can set up a tank and ignore it, and fail at it miserably. A fair amount of my steady work is from places who have put a tank in not realizing what it needs for proper care and upkeep. They want to have it, but they don't want to get their hands wet. It's kind of something I just fell into. I've been keeping fish myself since I was a kid. I was seven or eight years old, and I got a tank for Christmas. Santa Claus brought me a fish tank. Back then it was my father looking after the upkeep. When I started making my own money—doing yard work and babysitting, stuff like that in the neighbourhood—is when I started really getting into it and experimenting with different fish. As far as doing this for a living, it was an idea that came to me one day. It came up in simple conversation with some friends. A few weeks later, I get a phone call from someone at a dental office in Bedford, saying, "We were talking to a friend of yours who said you were thinking of maybe doing something like this. We have a tank here we need some help with." That was it. Is this your sole occupation now? Yeah, this is what I do for a living. Any day, I'm on the road and I will do anywhere from eight to a dozen tanks a day, depending on the day and the schedule. Every Monday morning, I'm at the same dental office, at the same time. After that, I go to a vet clinic. So what does a service call entail? Well, every tank is different, OK? They all require the same thing, within reason. A tank will become its own environment over time. But essentially the same thing is done to all tanks when I go to visit them. I take X percentage of the water out. It's just a simple syphon that I use, which I run through any substrate on the bottom. Everything sinks, right? Food waste, fish waste; it all sinks. So it's gotta come out. Taking some water out, cleaning filters, wiping down the tank itself, any decor inside that needs a cleaning, check that the filters, heating and lighting are running OK. Some tanks have a ridiculous amount of gear running them, and some have next to nothing running them. Each tank is its own thing, for sure. Why do so many doctors, dentists and offices put fish tanks in their waiting rooms? It's nice to have a focal point, other than just some two- or three-year-old magazine that's been sitting there or radio in the background. Something that's alive, right? It's been proven—there've been studies on this—that a tank will actually lower your blood pressure. It calms your nerves. So dental offices really like them, because nobody likes going to the dentist. But a lot of places have them just because, aside from any effect it might have, it's just a nice thing to have. As long as it's well-kept, of course. There's nothing worse than a lousy looking fish tank. Do you have a favourite tank out of the ones you work with? I don't think I really have a favourite tank. I do have some fish that I really like to see every week. I have a large tank that I care for at the IWK that has a group of fish in it that I actually had myself. They outgrew the tank I had and I brought them in there for the kids to enjoy. That was 10 years ago and those fish are still there. And those fish were several years old when I brought them in. I really like going there and seeing those fish. The tank is great, don't get me wrong, but those fish are great. They come right up, they'll eat right out of my hand. They're just really something else. I really like to go see those guys when I'm there, for sure. Wheeler’s fish friends at the IWK. I don't think a lot of people think of fish as good pets. People who haven't had fish don't, no. Fish are funny because people will say, "They don't love you back, like a dog or a cat." Maybe not in an affectionate sort of way, but when a fish will come to you—when it will swim through your fingers and even rest in your hand—it's not only a food response. I don't care what anybody says. There's more to it than that. It's not just about getting fed. I'm convinced there are fish that will recognize you, or me or someone else as individuals and come say hello. But fish are great. You have fish in your house for X number of years and when they die, when they pass on, it can be a big hit on you. I'm not going to lie to you, I've cried over fish dying before. Are there any advanced aquarium items or fish you'd warn someone away from? I've learned over the years doing this, both professionally for people as well just being a hobbyist, that simple is better. There's so much equipment on the market, it's ridiculous. There are things now you can control with your phone, and on the internet, that will do things in your tank and give you readings. That just blows my mind. That's beyond me. Some fish are very particular about their water parameters. There are some that are much heartier than others. As the guy being hired on and who's responsible, I don't want something too fussy that I can't be at more than once a week. Usually, clients who call me, they don't know one fish from another. Usually, it's, "We want fish. You're the guy. Set it up pretty." And we go from there.